Travellers who collect Marriott Rewards, The Ritz-Carlton Rewards, and Starwood Preferred Guest (SPG) will have access to a single unified loyalty program come August. The changes are quite dramatic but are mostly positive. The new program doesn’t have an official name yet, but guests will be able to book stays and earn or redeem points at all participating 29 global brands which covers 6,500 hotels in 127 countries and territories. “We listened to the travel aspirations of our members and set our sights on unlocking the full potential of our loyalty programs,” said David Flueck, Senior Vice President of Global Loyalty, Marriott International. According to Marriott, the change is happening this August, but there’s no firm date in place yet. When that date becomes official, Marriott Rewards, The Ritz-Carlton Rewards and SPG members will be able to merge their accounts into a single loyalty program. A new single digital reservation system will be introduced in early 2019, which will making the booking process easier as you’ll be able to find accommodations at all participating properties. This announcement allows members to take full advantage of the new benefits as soon as possible. In addition, new exclusive member experiences will be introduced throughout the year. The new program means that a single points currency will be introduced. SPG members will need to combine their accounts with Marriott come August where their points balance will triple. In other words, 1 SPG point = 3 Marriott Rewards Points (or whatever the new name ends up being). Marriott Rewards and The Ritz-Carlton Rewards members don’t need to worry about anything as their points will remain the same. Once all of your points are merged, any new points you earn will be credited to the combined loyalty program. How are points earned under the new program? Ten points will be earned per dollar spent at all brands with the exception of Residence Inn, TownePlace Suites and Element which will be five points per every dollar spent. Depending on your status, you could earn up to 75% in bonus points per dollar spent. There’s also the Starwood Preferred Guest credit card from American Express which will allow you to earn points on all of your everyday purchases. What happens to my status? The current nights you have accumulated for status will be combined, which means you might actually qualify for some of the new status tiers right away. Silver elite is now earned at 10 nights, Gold elite at 25 nights, Platinum elite at 50, and Platinum Premier at 75 nights. Platinum Premier members who surpass 100 nights and $20,000 worth of spend will become a member of the ambassador program. If you had achieved lifetime status, you’ll continue to have that recognized. Free breakfast will now be offered to Platinum and Platinum Premier members and will be expanded to 25 participating brands. How many of the new points do I need to get a free night? Under the new program, it’ll cost you 7,500 points for a free night at a Category 1 hotel while on the higher end of things, it’ll cost you 85,000 points for a Category 8 hotel. 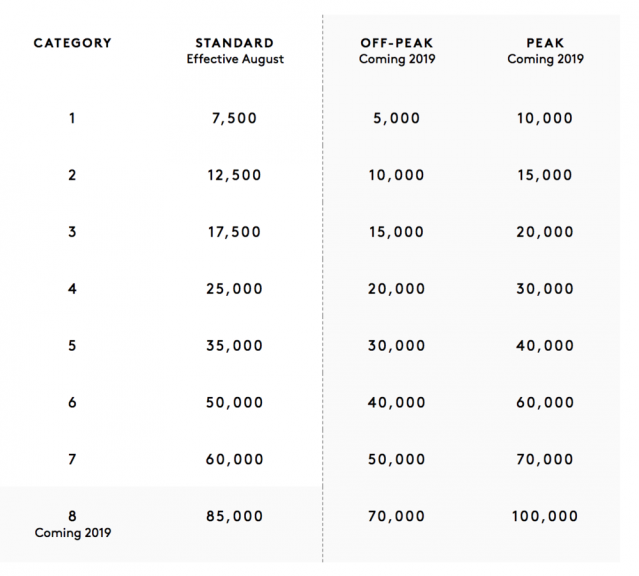 It’s important to note that many hotels will be recategorized to fit within this new category scale and there will be no blackout dates for points redemptions, meaning you can claim a free night any day of the year including holidays. MORE: Are Air Miles worth it? For reference, currently it takes 3,000 SPG points or 7,500 Marriott points to get a free night at a Category 1 hotel. A free night award chart is being introduced in 2019 where the amount of points required for a free night will depend on peak, standard and off-peak pricing at all hotels. Generally speaking, off-peak will cost you about 20% less in points for a free night while the peak season will see a 20% increase. The award chart will start in 2019, so anything booked for 2018 will be at the standard pricing for a free night. Marriott International purchased Starwood Hotels a few years back and almost immediately allowed members to transfer points between Starwood Preferred Guest and Marriott Rewards. Despite this flexibility, the two programs remained quite distinct with different features and status tiers that didn’t automatically transfer over to each other. By formally merging all of the rewards programs, it’ll be much easier for guests to manage their points.